New Delhi: International suppliers of key fertilisers di-ammonium phosphate (DAP) and NPK fertilisers have agreed to reduce prices of the crop nutrients by 5%, a top industry official said on Thrusday. 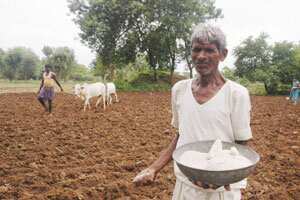 “Global suppliers have agreed to cut fertiliser prices by around 5%. DAP will now be cheaper by $ 35 per tonne and NPK (Nitrogen Phosphate and Potassium) fertilisers by $25 per tonne," Indian Farmers Fertiliser Co-operative Ltd (IFFCO) managing director U S Awasthi told PTI. With the reduction in prices, there will be no increase in the maximum retail price (MRP) of DAP and NPK fertilisers sold by IFFCO till March 2012, Awasthi added. “We are contracting DAP at $677 per tonne and NPK fertilisers at $617 per tonne and with the cut there will not be increase in MRP by IFFCO till March 2012 as the contracts are for that period," he said. Meanwhile, the rupee today strengthened by 21 paise to 52.14 against the US dollar in early trade. Yesterday, it ended at 52.35/36 - its all-time closing low - against the US dollar. India imports 90% of its DAP demand and the entire requirement of MoP. The country is estimated to have imported 5.6 million tonnes of urea, 3.81 million tonnes of DAP, 2.6 million tonnes of MoP and 2.17 million tonnes of complex fertilisers during the Rabi (winter) season 2011-12. The inbound shipments of urea, DAP and MOP stood at 6.61 million tonnes, 7.41 million tonnes and 4.5 million tonnes, respectively during the whole of 2010-11 fiscal.